Blackpool Zoo’s new colt foal. There were no reports of a magical star in the heavens to mark the occasion, but there is no doubt that Blackpool Zoo’s latest arrival is a very special fellow, indeed. The new arrival is yet to be named. 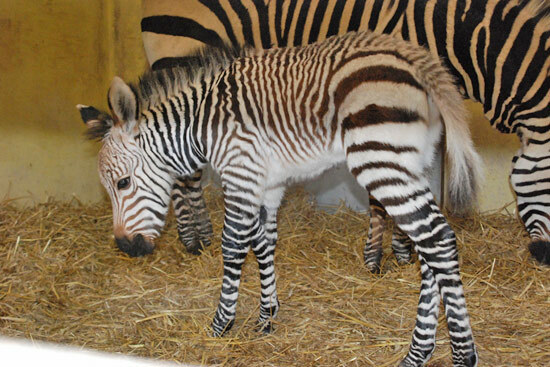 The British zoo has announced the birth of a male Hartmann’s Mountain Zebra foal, who has been named Benni. Benni is only the fourth of his kind to be born in Britain for the past decade and is considered a hugely significant addition to the European Endangered Species Programme. The birth was discovered by senior mammal keeper Sofie Fawzy on her arrival at work one recent morning. She found him on his feet and feeding from his mother. Blackpool Zoo broke a nine-year absence of Hartmann’s Mountain Zebra births in 2011 when its other resident female, Helene, gave birth to Tebogo, who recently moved to an all-male group in Germany. The father of both foals is Fernando. Although keepers suspected that the mother, Betty, was pregnant, a due date was not confirmed. It was hoped that, as an older mum, 19-year-old Betty would give birth safely to her very first foal. Sofie, who also oversaw the birth and rearing of Tebogo, said: “We are absolutely delighted to have another foal and mother and baby are doing very well. “It will be fantastic to see another lively young foal running around. Tanya Langenhorst, the International Studbook Keeper & European Breeding Programme Co-ordinator for Hartmann’s Mountain Zebra’s, congratulated the zoo on the birth. The International Union for Conservation of Nature Red List of Threatened Species 2011 lists Hartmann’s Mountain Zebras as Vulnerable, with a total population of fewer than 9000 mature individuals. Current studies indicate that this number could decline by more than 10 per cent in the next 25 years due to an increase in hunting and loss of natural habitat to agriculture. Hartmann’s Mountain Zebras are native to Namibia and most commonly found in the extremely harsh environmental conditions of the Kunene Region in the northwest. There are 16 Hartmann’s Mountain Zebra in Britain and four of them live at Blackpool Zoo. Betty and her new arrival share the paddock with Helene and Fernando, who are eight and seven respectively. "Am I too fat to ride a horse?" Could dust be hindering your horse’s performance? Could dust be hindering your horse's performance? Copyright © 2019 Horsetalk.co.nz. All rights reserved.